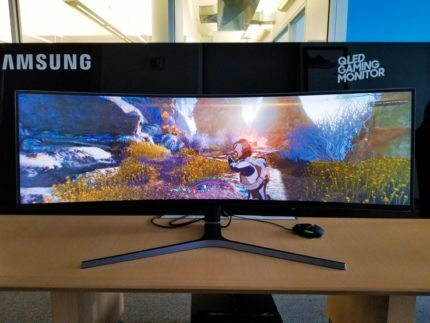 Samsung has just recently announced three new curved displays that will feature 144Hz refresh rate, 1ms response time, HDR support, and quantum-dot technology for both smooth gameplay performance and astonishing image quality. The most exciting display among the three is the Samsung C49HG90 which will feature a double Full HD resolution at 32:9 ultra-wide aspect ratio, or in other words 3840×1080. Lately, VA panels have been moving towards developing faster and faster response time speed, ultimately gaining the advantage over the IPS panels. Samsung had already managed to increase the response time speed to 1ms on their quantum-dot VA panels with their CFG70 series released last year by using MPRT (Motion Picture Response Time) technology. 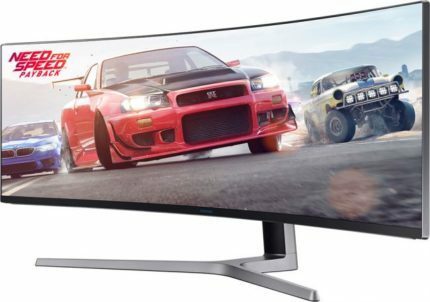 This time, the Samsung C49HG90 FreeSync 2 monitor will utilize the so-called 4-channel scanning along with the MPRT technology to achieve the lighting fast 1ms response time speed across the entire screen for minimal motion blur and ghosting. In addition to the 144Hz and dynamic refresh rate, it’s a perfect gaming monitor. 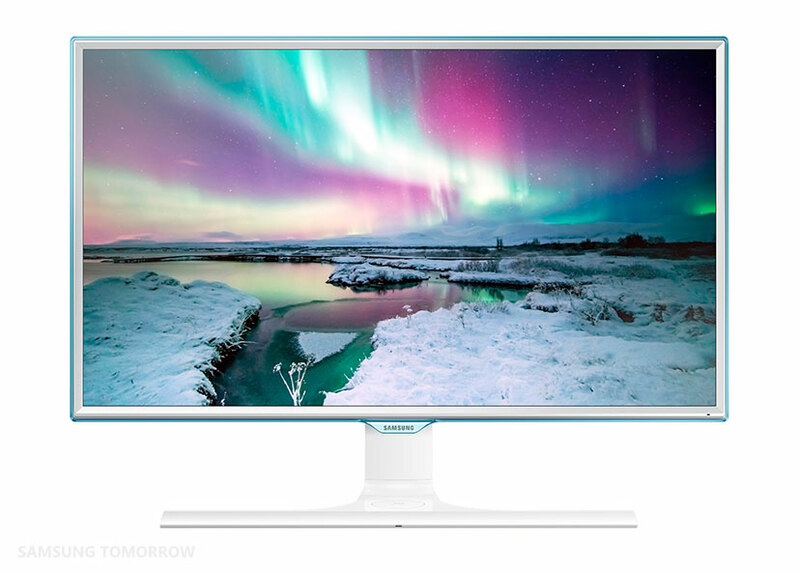 Essentially, the Samsung C49HG90 monitor looks as if you were to put two 27-inch 1920×1080 monitors next to each other, just without the bezel in between. The DFHD (Double Full HD) resolution of 3840×1080 on a 49-inch screen size will result in a solid pixel density of 82 pixels per inch, which is as dense as 1080p on a 27-inch monitor. Considering that you probably won’t be sitting as close to this giant as you would in front of a 27-inch screen, the pixel density shouldn’t be an issue. Not only will the Samsung C49HG90 display deliver smooth performance, it promises an amazing image quality as well. The QLED panel, using quantum dots, expands the color gamut to 125% sRGB and 95% DCI-P3 color spaces, in turn, delivering vibrant colors. Moreover, it supports HDR (High Dynamic Range) and most likely HDR10 format due to its high brightness, contrast as well as color depth and gamut. Samsung SVA panel ensures the impeccable 178-degree viewing angles and high contrast for a superior relation between dark and bright colors and deep black tones. HDR comes at no cost of latency or input lag as it’s the case with HDR TVs. Moreover, the Samsung C49HG90 display will support HDR no matter if you’re using AMD Or Nvidia graphics cards. The latest G-Sync HDR announced monitors such as the Acer Predator X27 will support HDR only via Nvidia G-Sync. Basically, FreeSync 2 technology will function much like the regular FreeSync. It synchronizes the refresh rate of the Samsung C49HG90 monitor to the frame rate of a FreeSync compatible AMD graphics card. Within the dynamic refresh rate range, screen tearing and stuttering is eliminated and input lag is reduced. The problem with the original FreeSync was that the dynamic range was too narrow on the lower end. As a consequence, when your FPS (Frames Per Second) rate would drop below the dynamic range, FreeSync would stop working. FreeSync 2 will solve this issue by utilizing LFC (Low Framerate Compensation) which ensures that the maximum refresh rate is at least 2.5 times the minimum. In this case 36 (or lower) – 144Hz FreeSync range. Additionally, FreeSync 2 allows for HDR or HDR10 compatibility and ensures excellent latency. Just like FreeSync, it doesn’t add extra cost to the monitor and it’s only supported by AMD graphics card. The Samsung C49HG90 144Hz monitor offers full ergonomic support including height adjustment, tilt, swivel, and VESA mount compatibility. A light matte screen surface will almost certainly be applied to the flicker-free screen of the monitor. It also features 1800R curvature for extra immersive gameplay and multimedia experience while the bezels appear to be slender with an eye-catchging dark blue matte. Connector ports of the Samsung C49HG90 include a DisplayPort 1.2a, miniDisplayPort 1.2a, two HDMI with unspecified versions, audio line-out, a microphone jack, and a USB 3.0 hub with two downstream ports as well as one upstream. The Samsung C49HG90 price amounts to $1,500 and it’s available for preorder at the moment (10 June). Other QLED HDR models include the Samsung C27HG70 as a 27-inch version and the Samsung C32HG70 with a 31.5-inch screen. The Samsung CHG70 series offers FreeSync 2, quantum-dot technology, and HDR just as the Samsung CHG90 monitor. The Samsung C49HG90 release date is set on June 30, while the CHG70 models should be available around 26 June. The Samsung C49HG90 PC monitor offers everything you need for a fluid gameplay experience, dynamic refresh rate with great range, high 144Hz refresh rate, and the rapid 1ms response time speed. In addition to responsive gaming, the monitor also ensures flawless image quality thanks to the HDR support, quantum dots, and high-contrast VA panel. Not so long ago, VA panels could have been considered as a middle ground between TN and IPS due to an in-between performance of the response time, viewing angles, and color accuracy. Nowadays, it’s the VA panel of the Samsung C49HG90 that is bringing all the pieces of an ideal gaming monitor closer and closer together. 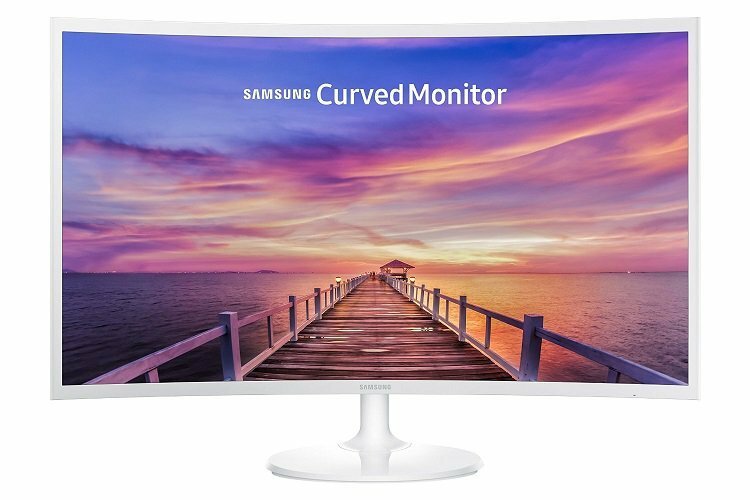 Use the button below to check the current price of this monitor, but only if it’s been released. Otherwise, it will just search for the monitor on Amazon. The Samsung C49HG90 combines all the key gaming specifications needed for smooth gameplay such as 144Hz, 1ms response time, and dynamic refresh rate with quantum dots and HDR technology for an equally amazing image quality. Overall, this display has it all, and it’s huge! I would really love to buy this monitor but I don’t think AMD has a card that would drive this at the rates necessary. I have a GTX 1080 and would think I would need to upgrade to the GTX 1080 TI to do it justice. And I’m concerned about game support for this aspect ratio. I haven’t seen any listing of compatible games. This monitor is designed around AMD, not NVidia. It’s a Freesync 2 display. If you own an NVideo GPU be sure to upgrade to an AMD GPU to drive this monitor properly. Buy a single current high end AMD card and it’ll be amazing. I plan to drive it with two ASUS R9 Fury Strix (which I bought in 2015), but I’m sure a single AMD Radeon RX 64 or 56 Vega would do the job, though I’d buy the AMD Radeon Vega Frontier for the added memory. My two ASUS R9 Fury Strix are driving an triple monitor eyefinty array (5760 x 1200 res) with great performance, so a 3840 x 1080 will be a walk in the park. Since it’s not higher than a normal 1080p 27″ 19:9 display it makes sense that it’s 1080. This is basically 2 27″ 1080p monitors next to each other. Driving this with a 4k resolution or something would be quite demanding. But like this, it’s actually achievable without a massive effort.